Over my 38 years, I've grown to "know myself" a lot better. I know, I know, that sounds mighty corny. But bear with me for a moment. I am an empathetic "feeler". Being an introvert, people might not know that immediately, as I also place a high value on emotional modesty. And that's not all bad. In fact, I think it's often a beautiful thing, and I wouldn't trade it in order to feel less. But the flip side of that is that I'm easily prone to discouragement. And, I'll admit, January's been a month of struggle for me. The weather, the homeboundedness, the political climate, my partner in life being gone for two weeks. Probably the biggest struggle I've met with is spiritual discouragement. Not with the Lord or the Word, mercy no! But the pre-field ministry has been hard this month. I've seen so many great successes by fellow pre-fielders. And that's a glorious thing, praise God! I wouldn't begrudge them that in a heartbeat. But sometimes, in private moments, the smile slips and discouragement seeps into my heart. What are WE doing wrong? What could I do better that would more readily communicate the need to those around me? But that's the trouble right there. I'm spending too much time thinking about me. I must keep my eye on the prize, which is to run the race that's been marked out for me, the course that God mapped out specially for ME before the foundations of the earth were even layed. Although all followers of Jesus Christ share the same end goal of growing in holiness and Christlikeness, my race is not the same as anyone else's race, so why compare? As Teddy Roosevelt (or maybe Dwight Edwards, but that's neither here nor there) famously said, "Comparison is the thief of joy". And it's so true. Here's the best news of all, the antidote to all the discouragement, comparison, and sadness - I don't have to deal with that all on my own and neither do you! Jesus promised us a Comforter. 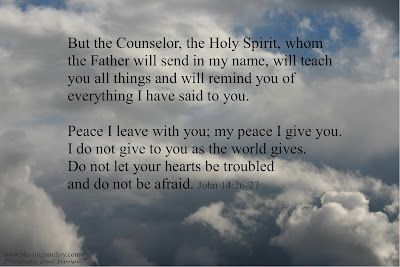 The only true and perfect Counselor - the Holy Spirit.